Spending quality time with friends can be tough, especially as a hairdresser working most Saturdays. We decided to make a reservation at Butcher Block, dress up and enjoy an afternoon spoiling ourselves with delicious food and wine. Arriving at this very well decorated, classic but rustic restaurant, we knew we would have a wonderful time. We opted to sit outside on the deck as the summer sun and blue skies demanded to be enjoyed. From the get go we received service with a smile, drinks came quickly and so an afternoon of catching up commenced. We ordered a variety of starters among us to share. As you can see by the photos above, they all look rather appetizing, which they were, with the only small criticism being the Camembert starter being on the tiny side and the mussel sauce just a tad runny. Flavours were spot on and if I were to recommend a value for money starter it would be the black mushrooms and the three cheese prawns as they were a great size and utterly delicious. One thing I need to mention at this point is that Butcher Block runs a lunch time special from Mondays to Saturdays at R75 including a glass of wine. Most restaurants don’t offer lunch time specials on a Saturday, so this is a huge positive for me. Us girls all opted for the lunch time steak which was more than enough for us. 200g Sirloin served with a side of chips (other sides can be substituted at a small additional cost of R10). The steaks were all prepared to order, came out sizzling hot and were all perfectly cooked. 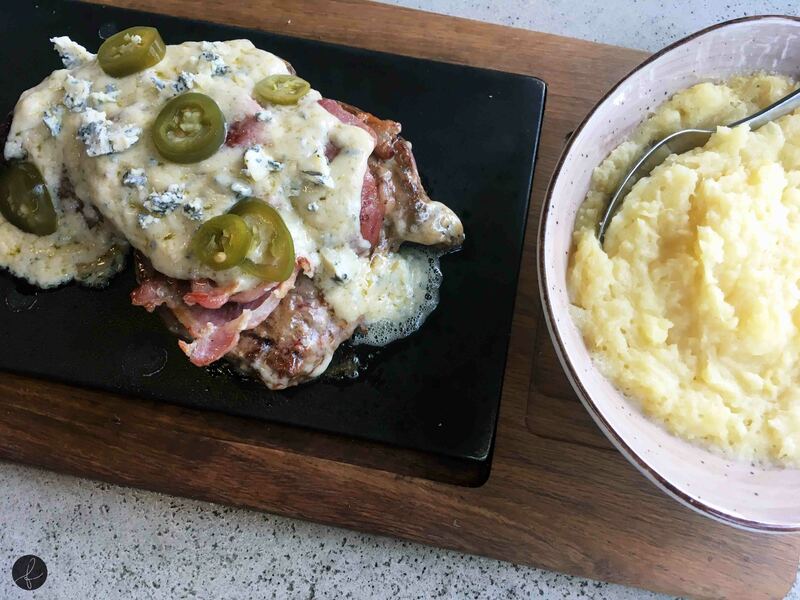 My hubby had the Blue Cheese and Jalapeño topping on a 300g rump with a side of mash for R190. This topping included pan-fried bacon, a creamy blue cheese sauce, chunks of local blue cheese and some sliced jalapenos. The mash was homestyle, meaning it still had some small chunks of potato in it. It was very comforting and I must say I really appreciated the fact that it wasn’t pretentious, just good wholesome mash. YUM. Look, Butcher block isn’t considered a cheap eats restaurant in upper highway area, but it’s really a great option for a special occasion, end of month spoil or just an excuse to get a little dressed up for a meal. The lunch time special is a great initiative from them as I would likely eat there more often based on this special. There are six amazing meals to choose from, so you really are spoilt for choice. Triple chocolate brownies topped with dollops of marshmallow frosting served with fresh cream or vanilla ice-cream. The brownie itself was decadent and gooey as promised, fulfilling all my chocolate needs, the marshmallow was a little disappointing as it didn’t look anything like the picture I saw on Facebook, but the ice-cream and cream redeemed this dish, making it an enjoyable dessert overall. To conclude, we had a fabulous afternoon drinking wine, eating yummy food and spending quality time with our friends. The service was as mentioned, fabulous and we will be frequenting Butcher Block for sure!! !